Our systems are based on modern and future-proof internet technology utilizing advanced technologies such as document-based databases and biological neural networks. This enables us to not only integrate multiple sensors capable of capturing diagnostic information for additional diseases but also to learn from the usage of our system by analyzing incoming data and other usage information. Over the last three years the team has developed the underlying technology, with the BodyTel system now being deployed to customers in Germany, providing assistance to patients and their carers. The BodyTel System is a system that facilitates the management of chronic diseases and assists with the measurement of key vital functions and indicators of these diseases (including, but not limited to blood glucose, blood pressure and weight levels) as well as assisting with the monitoring of prescribed therapies for chronic diseases (including medication dosages, diets and levels of physical activity). In addition to the above vital functions, a patient’s level of physical activity and diet patterns are also relevant to the management of chronic diseases. Currently, most patients record these measurements manually on paper or using simple electronic diaries operated on mobile devices. While electronic recording of information is superior to manual recording in that the process can be less time consuming and the recording of information is more consistent, a major drawback of these management systems is that the information recorded is not shared and analysed in real-time. This is where the BodyTel System can have a role to play. The BodyTel Sensor – This is the blood glucose measurement device which collects diagnostic information (blood glucose levels) that will be transmitted to the BodyTel Webportal for further analysis. The BodyTel System is also capable of transmitting and analysing vital physiological data that is captured from different medical measurement devices. The BodyTel App (BodyTel Mobile) – This is the mobile application that connects medical measuring equipment to mobile devices (such as smartphones), which allows users to wirelessly transmit diagnostic data to the BodyTel Backend. The BodyTel App is capable of receiving automatic responses from the BodyTel Backend and distributing such responses to the user. The BodyTel Webportal – The BodyTel Webportal is a web portal developed by BodyTel for use with the BodyTel App. 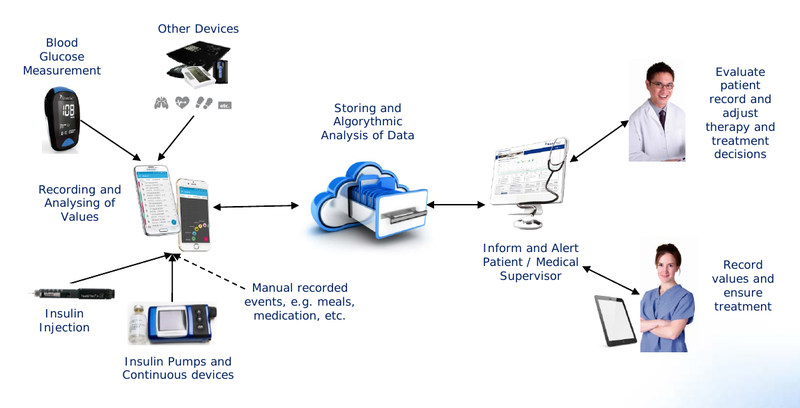 The BodyTel Webportal is able to analyse medical diagnostic information that is captured by the BodyTel Sensor or any other medical measurement device and transmitted via the BodyTel App, to provide a diagnostic recommendation. Similar to the BodyTel App, users of the BodyTel System can access the BodyTel Webportal to view a ‘diary’ containing their measurement information and diagnostic recommendations. Users are also able to manually record further information, including diet routines, exercise regimes and medication dosages; using the ‘diary’ function of the BodyTel Webportal. of key vital functions and indicators of these diseases (including blood glucose, blood pressure and weight levels) as well as assisting with the monitoring of prescribed therapies for the chronic diseases (including medication dosages, diets and levels of physical activity). The My-Lifespot system takes the form of a mobile application, known as the My-Lifespot App, which can be downloaded on smartphones operating Apple iOS or Android platforms. Users of the My-Lifespot App are able to capture photographs of their skin conditions, which are then automatically uploaded to the My-Lifespot Server. The My-Lifespot Server is a computer server that runs a patented pattern recognition algorithm to produce a diagnostic result for photographs of skin conditions uploaded to the server. The My-Lifespot Server produces a diagnostic result by evaluating the photographs against its database of classic skin diseases in conjunction with the user’s answers to several diagnosis questions. As noted above, the My-Lifespot System is able to provide a preliminary diagnosis of skin conditions, by analyzing photos uploaded to the My-Lifespot App together with users’ response to several questions. By enabling users of the My-Lifespot App to diagnose a wide range of classic (non-cancer) and non-classic (cancer) skin diseases, the My-Lifespot System is able to improve the likelihood of early detection of skin diseases. The My-Lifespot System is able to produce a diagnostic result by relying on its database of classic skin diseases and its patented Biological Neural Network patented pattern recognition algorithm (BNN). In contrast to traditional computing systems and Artificial Neural Networks, the BNN is unique in that it is able to simulate behaviour of the human brain and thus, is self-learning and capable of analyzing low-resolution images. The longer the BNN is run and the more diagnoses that the BNN is required to generate, the quality and accuracy of each diagnosis improves. Furthermore, the BNN is self-monitoring, meaning that all diagnostic results are anonymously and automatically stored and analyzed, and notifications for system improvements are triggered if certain quality thresholds are not met.